Legendary Marks are a form of currency used to purchase Legendary gear. 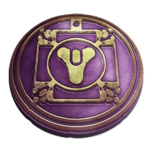 They were introduced in The Taken King as a replacement for Vanguard and Crucible marks. Like glimmer, marks are shared across all three characters. While there is no limit to how many marks per week a player can collect, the cap is at 200 marks. Legendary armor and weapons from the Vanguard, the Crucible, and the three Faction vendors. Legendary engrams from the Cryptarch.